The Hawaiians called him simply “Hume.” Alexander Hume Ford (1868-1945), magazine editor, playwright, photographer, unabashed campaigner and founder of Hawaii’s Outrigger Canoe Club, traveled widely in the Pacific Rim and promoted Duke Kahanamoku and George Freeth to an American audience. But he may best be remembered as the “guy who turned Jack London on to surfing.” If he is remembered at all. Duke Kahanamoku, with his Olympic and world-record stardom and surfing demonstrations, is widely considered to have been the ambassador who introduced surfing to the Atlantic Coast of the United States. But the real credit may lie with Ford. But what accounts for the similarity? For a little context, earlier that month, Ford and George Freeth – who taught Ford to surf – had traveled the islands with a 28-member U.S. congressional delegation whose ostensible mission was to determine whether Hawaii could qualify for future statehood. Freeth acted as the delegation’s lifeguard, while Ford worked the politicians. Meanwhile Ford, barely more than a beginner himself, offered to teach Jack London how to surf, and the next day he and Freeth kept London out For a little context, earlier that month, Ford and George Freeth – who taught Ford to surf – had traveled the islands with a 28-member U.S. congressional delegation whose ostensible mission was to determine whether Hawaii could qualify for future statehood. Freeth acted as the delegation’s lifeguard, while Ford worked the politicians. London’s magazine article “Surfing: A Royal Sport,” published in October 1907, introduced the Western world to the sport of surfing on wooden boards. In 1908, Ford founded the Outrigger Canoe Club, the first formal organization with a mission of preserving surfing. Ford petitioned Queen Liliuokalani for use of a tract of land on Waikiki to popularize old Hawaiian water sports and to provide a place to surf for the children of the mauka, the people who lived in the hills and had no seaside of their own. With a fifty-year lease at $50 a year, the club was founded with a grass shack for a locker room and an open-pipe shower with a coconut thatch shower curtain. Although Ford’s club was for the mauka, when it opened it was restricted to haoles, white people from the mainland. So Ford urged the Hawaiians to start a club of their own. They organized the Hui Nalu Club, whose best swimmer was Duke Kahanamoku, and began to compete with the Outrigger Canoe Club. Kahanamoku’s world-record performances at the 1912 and 1920 Olympics paved the way for native Hawaiians to join, but when the Duke was invited, he remained loyal to Hui Nalu, stalling for nine years before finally becoming a member. After establishing the Outrigger Canoe Club, Ford continued to promote surfing through various events, his writing and photography. He was one of the first photographers to capture action surfing shots, “perhaps, the first photographs of surfing ever to appear in magazines (St. Nicholas and Colliers).” And after Freeth moved to the mainland in 1907, Ford began promoting Duke Kahanamoku as “Hawai’i’s ‘Champion Surf Rider,’” years before the Duke gained fame as an Olympic swimmer. The earliest known record of Ford’s promotion on the East Coast was in 1919, when he showed movies of Hawaiian surfing to the boys of Charleston’s Crafts School, South Carolina, and met with them to form an aquatic club. Surely a bit of evidence exists for Funderburg yet to unearth, proving the odds that Ford’s passionate campaign is to account for the images in those postcards. 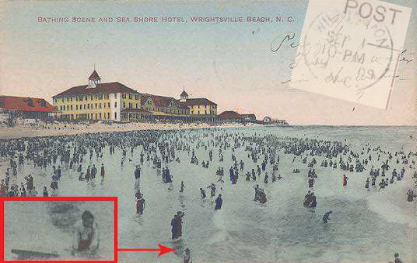 A North Carolina postcard from 1909 that appears to show a person in the water with a surfboard. If after you’ve read this article – and more of the excellent resources listed below – it is still Duke Kahanamoku and not Alexander Hume Ford who springs to mind when you think of the origins of modern surfing, perhaps that would have been fine with Ford. He viewed his job as doing the talking, and it is clear he got what he wanted. Special thanks to Joseph “Skipper” Funderburg for bringing to our attention his discovery of the Wrightsville Beach postcards. Funderburg is the author of “Surfing on the Cape Fear Coast,” Slapdash Publishing (2008). He has been writing about surfing for 40 years and is recognized as the Cape Fear Coast’s preeminent surf historian. We hope you’ll seek out a copy of his book and read more about him at http://www.carolinabeach.net. Julia Gilman, my paternal grandmother, was married to the brother of Atherton Gilman. Atherton was in that first gang of boys that Alexander Hume Ford crossed paths with in 1907 Waikiki. He asked them for surfing lessons and later approached Jack London, asking him if he’d like to learn how to surf. Thank you for sharing that story! Hume was inducted into the East Coast Surfing Hall of Fame this year and I had the pleasure of meeting members of his family. It was a great honor.